Monsters University, the anticipated prequel to the 2001 smash hit Monsters Inc., comes to life in Disney's new storybook app that takes you back to where it all began. 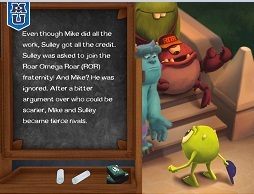 Follow the story of Mike Wazowski and James Sullivan before they became the star team on the scare floor through an interactive retelling of the story. As you navigate the storybook, certain elements within each page can be clicked on to animate characters, and the storybook app uses the familiar voices of Billy Crystal (Mike) and John Goodman (James) to bring the story to life. Scare cards are hidden throughout the story—finding and clicking on them will unlock new content. Not only can you use your iPad's camera to "monsterize" yourself, but the app also includes five games that use the gyroscope of your iPad to immerse you in fun activities like the Toxicity Challenge and Avoid the Parent—proving your scaring abilities and testing your ability to navigate around toxic human objects. There's also a Simulated Scare game where you ultimately roar to see how much energy you can generate in a simulation with a crash-test-dummy-like simulator kid. The Storybook app is available for the iPad on iTunes for $6.99.